Reno's romantic restaurants offer elegant surroundings and fine menu choices. Whether it's Valentine's Day or another occasion for romance, there is a romantic restaurant in Reno, Nevada, to help set the mood. Romanza is an Italian restaurant located in the Peppermill Hotel Casino. It is a romantic spectacle of sculptures, columns, a changing overhead sky scene, and torches. Romanza has won numerous awards for its cuisine. Wednesday through Sunday, 5:30 p.m. to 10:30 p.m.
Harrah's Steak House is Reno's only AAA four-diamond rated restaurant. We've eaten here with and we can tell you it is elegant. The service and food are superb - this place is a genuine treat that any couple will enjoy for romantic Valentine's Day dining. Nightly 5 p.m. to close. Early dining special Sunday through Thursday, 5 p.m. to 6 p.m. The Palais de Jade Chinese restaurant isn't in a ritzy location, but don't let that fool you - this is a nice, quiet place for a romantic dinner. You'll find French-inspired decor, excellent service, and very good food. There is a full bar for those wishing to enjoy an adult beverage. Every day from 11 a.m. If you are looking for spare, modern ambiance, excellent food, and personal service, Cafe de Thai in south Reno is a good choice. This restaurant has a full bar and is in a quieter part of town, away from the downtown hubbub. Monday through Saturday, 11:30 a.m. to closing. Sunday 5:00 p.m. to closing. La Vecchia features Italian cuisine in a casual, though not intimate, comfortable atmosphere. As you would expect at a good Italian restaurant, there is an extensive wine list from which to choose. For those with allergies, you can order wheat-free, gluten-free pasta. Rapscallion is in an unlikely part of town, but you won't be disappointed. Seafood is their specialty and the atmosphere, with dark polished wood everywhere, is romantic and intimate. Separate booths allow couples to romanticize without being a spectacle for other diners. Dinner nightly from 5 p.m.
Roxy's offers fine downtown Reno dining in the Eldorado Hotel Casino. Despite being inside a casino, the restaurant is classy and quiet, offering steaks, seafood, fine baked goods and various appetizers. Roxy's is also known as the place to have a martini, with 102 variations from which to choose. There is an extensive wine list as well. Every day, 5 p.m. to close. According to the Eldorado Hotel Casino website, La Strada is rated one of the 10 best Italian restaurants in the country. We tend to believe it because the Eldorado is really into Italian food. They are the primary sponsor of Reno's annual Great Italian Festival. The atmosphere isn't intimate, but the place is tastefully decorated and you will probably enjoy a great dinner with your romantic partner. Sunday through Tuesday, 5 p.m. to 9 p.m. Friday and Saturday, 5 p.m. to 10 p.m. Located inside Reno's Grand Sierra Resort, Charlie Palmer Steak is one of our better restaurants. The atmosphere is elegant and modern, not the wild west like some other steakhouses. Romance with a glass of wine from the extensive selection of west coast vintages. Every day, 5:30 p.m. to 10:30 p.m.
Beaujolais Bistro is Reno's only French restaurant of which we are aware. 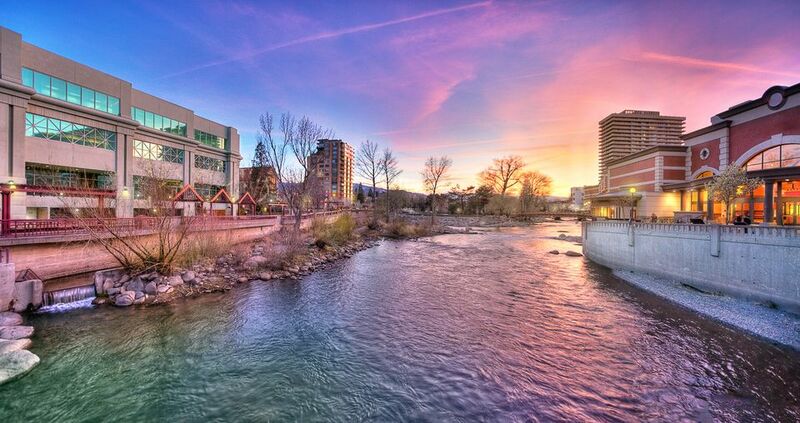 The cozy little bistro is located just west of the downtown Riverwalk District, next to the Truckee River. Being small and with no bar for waiting, reservations are recommended. Of course, there is a big selection of French wines to accompany your meal. Dinner is served Tuesday through Thursday, 5 p.m. to 8 p.m., Friday and Saturday, 5 p.m. to 9 p.m., and Sunday 5 p.m. to 8 p.m.
Luciano's gets good reviews for the food, service, and atmosphere. It's a little out of the way down in south Reno, but that probably adds to Luciano's charm and ambiance. La Famiglia is a family-owned Italian restaurant. In early 2010, it moved to a new location in a new building in downtown Reno. While not romantic per se, it is run by real Italians and you'll get authentic food. The reviews I've read are mixed - some think the place is great and others complained about slow, surly, and rude service. A person we personally know who has eaten there had a good experience. Opens at 5 p.m. daily.